Exploitation of maritime pine in the Landes region dates back to antiquity. Resin and pitch, stemming from its distillation, were used by the Romans to waterproof the amphorae or caulk boats. But, it was only through plantation and the systematic implementation of drainage works, over the second empire, that the industrial exploitation of pine began in the Landes. With a surface of almost one million hectares, the Landes massif is the biggest artificial forest in Western Europe, with the distinction, majoritively, of being under the ownership of private foresters. Along with the Aquitaine’s Regional Centre of Forest Property (Centre Régional de la Propriété Forestière d’Aquitaine), each owner uses a Simple Management Plan (aka: a PSG), in which the operating targets for the next 10 or 20 years are fixed. This planning and consultation efforts enable to anticipate the amounts of wood that will be produced, and contribute to the regulation of this important market. It also enables consolidation and sustains the development of a quality wood industry. The reasoned culture of the Landes forest is based on the observation of the life cycle of the maritime pine. It takes 45 to 50 years for a tree to reach full maturity. 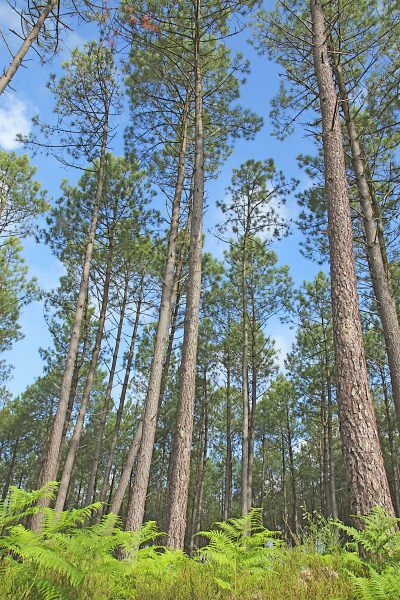 However, not all the pines planted in a plot will reach their maximum size, because foresters submit all the plants to a rigorous selection, throughout the lives of the trees. During the first four years of growth, several thinnings decrease the number of plants per hectare from 10,000 down to between 1,200 and 2,000. Subsequently, a certain number of additional thinning-outs will remove the weakest subjects to allow for better development of the best trees. Nowadays, wood originating from the exploitation of the Landes massif is mainly used for the manufacture of cardboard, framing, carpentry (beams, boards and compressed panels) and furniture. Gradually, new uses are emerging that aim to use the entire tree, thus, the stumps, sawing residue and even the pine needles are used to make firewood pellets for heating. What we call ‘green chemistry’, also plays a role in the diversification of these outlets. Polyphenols (procyanidolic oligomers), with attested medical, nutritional and cosmetic virtues, are found in the bark of the maritime pine. The same goes for the development and traceability of grapeseed, from which polyphenol is also extracted. “After having been pressed during the harvest, the grapes from the Bordeaux and Champagne vineyards are retrieved by distilleries, to make brandy (eau de vie). These are the seeds issued from residual marc, washed of all alcohol, that we exploit”, says Yannick Piriou. Installed at the gates of the Landes massif, not far away from the Bordeaux vineyards, the DRT plants are ideally located to exploit the products, in short circuits. A policy of common sense, which enhances and perpetuates, in a virtuous circle, the best of nature. Based in the heart of the Landes forest, DRT produces it’s Purextract® range of ingredients. Highly purified and objectified by clinical research, our extracts provide food supplements and functional food, with the effectiveness expected by consumers in many indications: cardiovascular health, lowering cholesterol levels, and also in the firming and radiance of skin (taken orally).